Technically, Client is a general name for component that connects to an instance of Handy Backup and allows accessing and managing tasks. In Client Setting you can change settings of the GUI Client (main application that you use to control the program). Check Show a splash screen on program startup to display a splash screen indicating that the program is loading. Check Enable tray notifications to be notified of task results in system tray. The notifications appear only if main window of the program is closed. 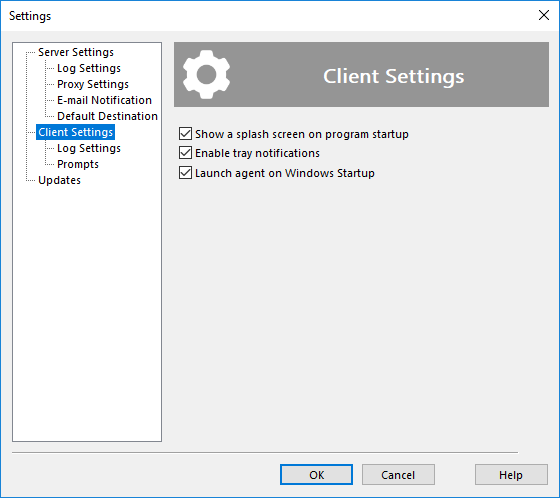 The latter option, Launch agent on Windows Startup does nothing (temporary option, not removed since version 6 of the program).